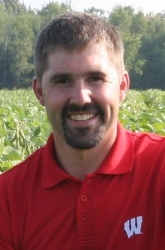 By Shawn P. Conley, Ph.D.
Summary: Pigweeds are among the most abundant and troublesome weed species across the Midwest and Midsouth because of their prolific seed production capacity and their ability to rapidly evolve herbicide resistance. This considerable challenge has sparked renewed farmer and practitioner interest in diversifying weed management by implementing integrated weed management (IWM) programs that efficiently manage weeds, increase soybean light interception, and increase grain yield. Our results suggest that even though agronomic practices such as row spacing and seeding rate can positively influence weed crop interactions a combined PRE followed by POST herbicide strategy was our most valuable IWM tool to decrease weed seed production and increase soybean yield.